If your own an RV or recreational vehicle, you know how difficult it can be to keep it out of the elements when not in use. Our collection of RV garage plans allows your recreational vehicle to be safely parked out of the elements keeping it looking like new when it’s not in use. Protecting your RV from the harsh summer heat and brutal cold of winter will keep it in tip-top shape all throughout the year. Browse our collection of RV garage plans and find the perfect one to suit your needs and lifestyle. 280 Sq. Ft., Width 44'-0", Depth 34'-0"
2154 Sq. Ft., Width 42'-0", Depth 42'-0"
580 Sq. Ft., Width 30'-0", Depth 24'-0"
230 Sq. Ft., Width 54'-0", Depth 40'-0"
192 Sq. Ft., Width 12'-0", Depth 16'-0"
417 Sq. 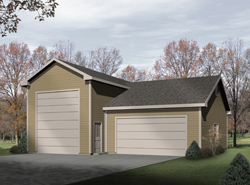 Ft., Width 30'-11", Depth 50'-11"
House Plans and More has several RV garage plans available in many styles and sizes perfect for your storage needs. We offer easy-to-read blueprints that allow you to visualize the look of the finished project. With a wide variety of plans, we are sure that you will find the perfect do-it-yourself project to fit your needs and lifestyle.